The GP607 combines Roland’s flagship piano sound and key action in an elegant grand piano cabinet, all at an affordable price. 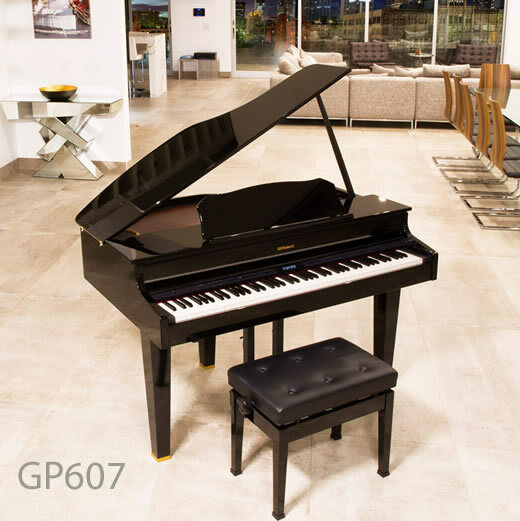 Whether the demand is for a stunning centre piece with additional features or an exceptional piano sound and touch, the GP607 ticks all of the boxes and includes a ten-year warranty. For a pianist who demands authentic and expressive key action, the GP607 uses the premium PHA-50 keybed, which combines the natural touch of a wooden key with the reliability and low maintenance of modern materials. The 4.1 multi-channel speaker system in the GP607 replicates every nuance of an acoustic piano, and makes a powerful system for music playback in a home or venue. It is housed in a mini grand piano cabinet that has been designed with meticulous attention to detail and is available in a polished black and polished white finish. Through Bluetooth technology, the GP607 can perform a multitude of functions for pianists and non-pianists. Wirelessly streaming music through the substantial speakers system on the piano; using the piano pedals to wirelessly turn the page of your digital sheet music; all this can be done without the need for any cables. By using the free Roland Piano Designer app, you can customise your piano sound to suit any performance or playing style.